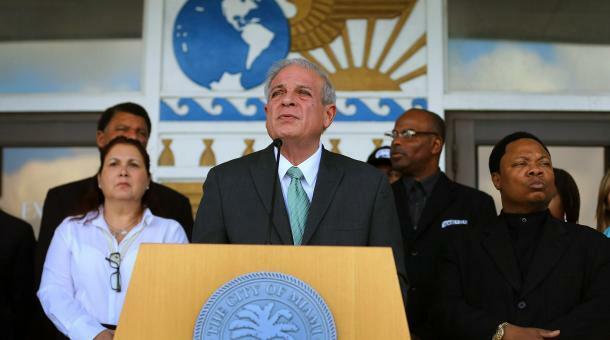 Miami Mayor Tomas Regalado surrounded by members of the community and other officials speaks to the media about gun violence on January 14, 2013 in Miami, Florida. Miami is a city made up of people from all walks of life. No one knows that better than Miami Mayor Tomás Regalado. "Miami is one of the most diverse cities in the world," says the mayor. "Sixty-some percent of people living in Miami were born outside the United States." Regalado is one of them. Born in Cuba, he came to the United States at age 14. After a distinguished career as a journalist , Regalado was elected mayor in 2009. Regalado sees his city's diversity as emblematic of 21st century America. "Miami, I guess, is the only city that officially has an area called Little Havana, Little Haiti, Little Managua, Little Tegucigalpa... I think Miami is what the United States will be in 25 to 30 years." Miami is also one of the country's richest cities, and one of its poorest. Given that reality, Regalado says he's working to implement policies aimed at closing the city's wealth gap and strengthen the middle class. "Miami is trying to become like Dallas, a city that will be a regional center for investors," says Regalado. "We have to seize the opportunity with Latin America and Asia to bring investors to Miami." As the immigrant mayor of a city of immigrants, Regalado firmly believes that the American Dream is still achievable for people coming to this country. "Number one, they need to understand that this is a country of law, understand that they need to follow the rules, understand that they have to work, and not live on handouts -- and by doing that, people can succeed," the mayor says. As his city continues to rebound from the recent recession, Regalado believes other U.S. cities, as well as the federal government, could learn a few lessons from Miami's recovery. "Learn about how Miami survived the crisis and is coming back as a great city by doing what every family in the U.S. did at the time, and is doing now -- living within its means," says Regalado. "I know this is very difficult for Washington to understand, but I'm not going to kill a city to save a government." This week, the Marketplace Morning Report is broadcasting from WLRN. Marketplace Morning Report will spend the first week of President Obama's second term broadcasting from Miami and demonstrating what some of the president's inaugural themes mean in real life. The raw materials for show host Jeremy Hobson and his production team of three are Miami's huge immigrant population, its great wealth and crushing poverty, and the enormous empty space between those economic extremes. Another relief bill is being offered by a Miami-Dade legislator for Florida residents who have been denied in-state college tuition rates because of their parents' immigration status. Republican State Sen. Anitere Flores' bill (SB 180, filed Monday) is similar to a measure (HB 17) that Miami State Rep. Carlos Trujillo filed early in December. The Obama Administration has announced another significant reset of national deportation law that could allow hundreds of thousands of illegal immigrants to apply for legal residency without leaving the country. It was another use of the president's executive power, analysts say, to soften the ground for major legislative immigration reforms ahead. The new policy applies to immigrants who are spouses, parents or children of U. S. citizens and would otherwise face long family separations under the previous process of applying for residency.